Where I Got It: Borrowed it from a friend! Goodreads Summary: Saxon, Kenzie, and Lieam, members of the fearless Mouse Guard, are dispatched to find a missing merchant mouse. Their search through dangerous terrain for the missing mouse reveals much more than they expect, as they stumble across a traitor in the Guard’s own ranks. 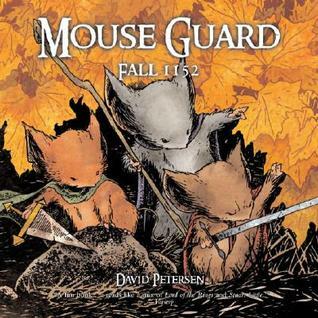 Mouse Guard is so freaking adorable it’s not even funny! I just loved it. You can’t go wrong with sword-wielding mice. You really can’t. The artwork was amazing, and the colors were so beautiful. The colors very much reminded me of fall, and made everything seem so warm and inviting. The mice in Mouse Guard have their own world, and I especially loved some of the extras at the end. There are all sorts of jobs that they have, and the maps of their territory were great. Some things are really easy for them, but there are also a lot of really scary and dangerous things for them too. Like crabs. They are very menacing creatures. And weasels, who are menacing in their own right. There’s a lot of intrigue and even betrayal, which I never expected, but it also made Mouse Guard interesting. They are not your average mice, and you can’t help but root for them. And…mice totally worked, because I can’t picture this story being told by (and focusing on) any other animal. I can’t fully explain it, but it just works. I just love the entire world of Mouse Guard. It’s a pretty simple story, but that is one of the cool things about Mouse Guard. It’s right to the point, and I felt like Petersen really put a lot of work and care into this story. Mouse Guard gets 5 stars.